Rotary Heritage and History Intl Fellows - About Rotary - What Is Rotary? The main objective of Rotary is service — in the community, in the workplace, and throughout the world. 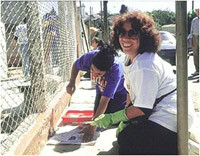 Rotarians develop community service projects that address many of today's most critical issues, such as children at risk, poverty and hunger, the environment, illiteracy, and violence. They also support programs for youth, educational opportunities and international exchanges for students, teachers, and other professionals, and vocational and career development. The Rotary motto is Service Above Self. Although Rotary clubs develop autonomous service programs, all Rotarians worldwide are united in a campaign for the global eradication of polio. In the 1980s, Rotarians raised US$240 million to immunize the children of the world; by 2005, Rotary's centenary year and the target date for the certification of a polio-free world, the PolioPlus program will have contributed US$500 million to this cause. In addition, Rotary has provided an army of volunteers to promote and assist at national immunization days in polio-endemic countries around the world.